Last week a dozen Groom Energy team members traveled to the City of Brotherly Love to take part in our 10th annual Lightfair tour. For two days, the team scattered across the Exhibit Hall floor, navigating around 30,000 other LED lighting fans, searching for what was new, cool and different. Surprisingly little has changed from last year. Standardization is here. Manufacturers, designers and customers are LED veterans. Unlike 2010, when Lightfair transformed into LEDfair, and new technology was everywhere, today’s innovations seem incremental. For our technically-oriented team, the show is now less about discovering that one new, radically interesting thing and more about visiting our existing, preferred suppliers and socializing with other lighting professionals. Visitors trust that LEDs have long life expectancy and large energy savings. They know the LED wattage equivalent for a 465w HID is @ 100 watts or an MR16 is @ 8 watts. While chip manufacturers are pushing past 200 lumens per watt, chips have fallen to less than 30% of the total cost. Now manufacturers need to push to find other points of differentiation. On the controls side, booth managers all have iPhone apps to show off their fixtures and wireless network control. IoT widgets, last year’s Lightfair theme, are common and integrated, although they continue to get smaller and cheaper. But people have already heard about most IoT capabilities and already expect to see what’s being shown. Even pricing has become consistent. There are fewer hot, new products that support Tesla-like, premium pricing. With all major manufacturers selling through distribution, end user product pricing is no longer a mystery. Buyers have developed a feel for where pricing should be based on their previous LED projects. So what was new and different? The applications. Manufacturers built the first LED products to look identical to the products they were intended to replace. With adoption now mainstream, this year we saw more of them pushing beyond lighting’s traditional form factors. Instead of designing an office ceiling with a perfect grid of 2×2 fixtures, we saw LED ceiling panels from CoolEdge, where the ceiling is a one giant fixture. Using an elegant translucent plastic covering, the entire room can be lit with an even glow of white light. The application looks futuristic. We also saw beam shaping from Acuity, using a Proteon fixture that we’re currently installing for a grocery chain customer. The fixture uses a custom optic to throw more light on the aisles and less light on the floor. 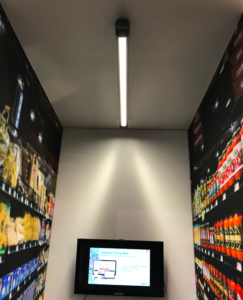 The shadowing effect was noticeable in the Lightfair booth (see photo), but not to the shopper, who just sees products on the grocery shelf more clearly. Philips described the recent report on the new Edge building in Amsterdam. The building’s design saves $3 per sq. meter in energy, $30 per sq. meter in space utilization and $300 per sq. meter in employee productivity. Originally designed for 1,700 workers, once the building occupancy and usage data had been captured, the building’s capacity grew to 2,600. Employees’ satisfaction and retention is higher and more are requesting to transfer there. Although we’re energy efficiency folks, it’s this employee benefit that brings the most significant corporate value. We’d never heard “space utilization” described at Lightfair and this year we heard it in multiple different booths. In smart city applications, Cisco said they are working on 500+ smart city projects globally. These new designs can address some known problems. If you’re work commuting in Paris you’ll spend 4 years of your life looking for a parking spot. In addition to finding you a space, these systems will add features like changing the traffic light from red to green when you’re the only car waiting. The cost justification can be 50% attributed to parking spot detection and traffic reduction, while 25% comes from energy and maintenance savings and 25% from sponsorship, free wi-fi and citizen engagement. We heard them noting that a 3M person city could spend $90M on a system and gain a net benefit of $50M over 5 years. Human-centric lighting applications are early and developing. Today’s newest systems can cycle a defined pattern over a 24-hour period to match natural daylight. This can help to reset natural circadian rhythms in senior living facilities. For schools, we saw a system configured to change intensity and color temperature throughout the day, optimizing for times when students are reading, feeling the post lunch blahs or needing added focus during lectures. Finally, we all know plant-centric lighting is growing the most – literally. Ever since botanists confirmed the positive effects of LEDs tuned for specific types of plants at specific stages of growth, their adoption has been surging. New investors in commercial greenhouses (read: marijuana) are buying as they search for higher yield on their crops – and investments. Sustainably sourced local food production and urban farming are also beginning to drive this market. Hopefully by next year positive results from human-centric applications will have spurred a similar level of investment enthusiasm.